Slanty Eyed Mama (Lyris Hung and Kate Rigg) in Happy Lucky Golden Tofu Panda Dragon Good Time Fun Fun Show! Photo by Corky Lee. BOTTOM LINE: Happy Lucky Golden Tofu Panda Dragon Good Time Fun Fun Show! is a rock and roll, spoken word, stand-up comedy event that offers some refreshing perspective concerning the "Amerasian" experience. Kate Rigg and Lyris Hung are "Slanty Eyed Mama." In Happy Lucky Golden Tofu Panda Dragon Good Time Fun Fun Show! this duo of self-proclaimed “Amerasians gone bad-assed” construct a variety show that satisfies this moniker. 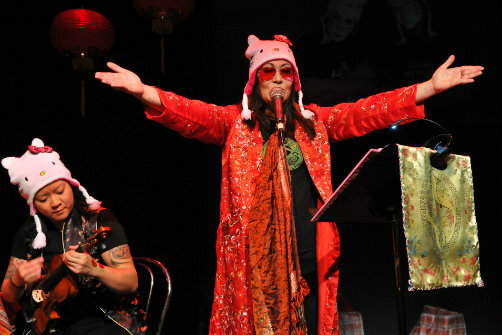 Provocative both in band name and show material, Rigg and Hung head an hour and twenty minutes of hilarious characters, stand-up comedy, video installations, and musical numbers that all deal with conceptions of “Asian-ness” in the United States. This ‘”fun fun show” is more of an extravaganza, with over-the-top kitsch decorations adorning the stage—a giant Hello Kitty stuffed animal kept her eyes on me throughout the night— and rock performances with Rigg on vocals and Hung on electric violin. The show’s shock value, though, is measured. It’s not superfluous or flashy for the sake of flash. What Rigg and Hung are getting at here is something much more meaningful than a few laughs at an imitation voice of an old Asian woman. (Rigg regularly does impressions of her mother throughout the show.) By lighting a fire under Asian stereotypes held in the United States, the pair, who met at Juilliard, makes you reassess why these stereotypes are held in the first place. They leave space for pause and reflection in between bursts of spectacle in order to let this larger issue sink in. Why does this concept of a race still exist in an era of such rich intercultural exchange in the West? During quick changes wherein Rigg transforms from a gymnast into a street peddler and Hung accompanies her on electric violin (this itself is deconstruction of a cliché that calls for critical consideration), the audience gets a chance to come down from pure amusement into assessment. Even the occasional technical hiccup doesn’t detract from Rigg’s command of the sizeable stage at the underground venue, Drom. Even in a slightly uncomfortable moment of confusion wherein a waitress approached the stage to let Rigg know her fly was down, Rigg played the digression flawlessly, reminding the audience “it’s a comedy show!” Perhaps because “it’s a show about identity politics and the examination of race relations in America” wouldn’t have been as entertaining. Happy Lucky Golden Tofu Panda Dragon Good Time Fun Fun Show! is written and performed by Kate Rigg and Leah Ryan. Music by Slanty Eyed Mama with Lyris Hung on the electric violin. Directed by the Happy Lucky Crew: Kate Rigg, Julie Polk, and Harris Doran. Design and Video Installation by Leda Razorikon Resurrecion.